Texture is everything. But it’s not one-size-fits all: Some days, you have a hankering for beachy and wild; the next, you’re looking for more restrained volume. The Shake Series has you covered 24/7—with a collection of transformative texturizers that take you wherever you want to go, high or low. Just shake, spray, and go! The look and feel of abundantly full, naturally thick hair without a trace of powdery residue. Shake, shake, shake and apply all over for instant thickness and body even on the finest hair. This body-building mist absorbs oils, giving roots a boost and plumping up hair with dramatic body and a soft, clean feel. Moldable yet dry texture for separation, definition, and lift. 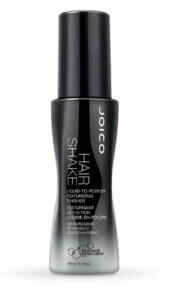 Shake, shake, shake and apply to long or short hair for moldable texture, grip, and volume on all types of layered hair. Satiny sheen with carved-out separation… and not a hint of parched, crunchy strands.